This new larger kit has adhesive that can be cut into any shape. It takes less than 1 minute to apply a patch with Badge Magic. And with Badge Magic, the patches can be easily moved or removed completely if necessary. No more sewing! This new larger kit has adhesive pre-cut for the round badges earned by Juniors, plus additional adhesive that can be cut into any shape. It takes less than 1 minute to apply a patch with Badge Magic. And with Badge Magic, the patches can be easily moved or removed completely if necessary. No more sewing! This new larger kit has adhesive pre-cut for the council ID, Troop Numbers, US flag, and other patches, plus additional adhesive that can be cut into any shape. It takes less than 1 minute to apply a patch with Badge Magic. And with Badge Magic, the patches can be easily moved or removed completely if necessary. 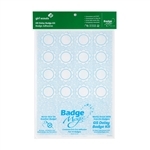 This new larger kit has adhesive pre-cut for the Counicl ID, Troop Numbers, the US flag, and other patches, plus additional adhesive that can be cut into any shape. It takes less than 1 minute to apply a patch with Badge Magic. And with Badge Magic, the patches can be easily moved or removed completely if necessary. No more sewing! 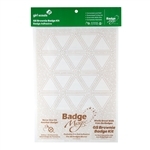 This is an adhesive kit for Brownie vests and sashes containing a pre-cut adhesive sheet for the triangular badges. Badge Magic is so easy to use, your Brownie can do it herself! Each kit has adhesive for 25 triangles and can be shared with others by cutting it into strips. Daisies now have badges of their very own! Here's an easy-to-use kit to make earning them even more fun! It takes less than 1 minute to apply a badge with Badge Magic. And with Badge Magic, the badges can be moved or removed completely if necessary. Kit contains 24 cut outs for the new Daisy badges. No more sewing! It takes less than 1 minute to apply a patch with Badge Magic. And with Badge Magic, the patches can be easily moved or removed completely if necessary.